Psychic Sally's Good Fortune To End? I didn’t need a crystal ball to predict an eviction showdown featuring Sally and Hardeep. At least the nominations were done slightly differently this time, with housemates giving one killer nomination instead of two ordinary ones. But this means we’ve gone through the whole series without an eviction with more than two candidates. They’ve both been bickering with each other for a while, so it’s kind of apt that they’re up together to face their nemeses. Psychic Sally Morgan (1.33) has come across as quite a normal, down-to-earth person in the house. She’s formed a nice friendship with Ryan and has tended to get on well with most of the housemates. We’ve seen her sat around being bitchy a lot, especially about Hardeep, but we’ve also seen her deliver some brilliant one liners. Her comment to Roxanne about the crowd chants “well that’s because they’ve seen what you’ve done” was a personal favourite. She has flown under the radar regarding nominations, but I’ve noticed she’s a particularly divisive character online, much like Hardeep. The audience criticised her for being a phoney this week after not knowing which boxes contained letters from home, even though that’s pretty much nothing to do with that she does (or pretends to do) for a living. Oh no, do I really have to write about Hardeep (3.95) again?! He’s facing eviction for the fifth time tonight. Because of this, Rylan (i.e. the producers) gave him the nickname ‘Hardeep The Destroyer’ on Bit On The Side. He’s still winding up most of the housemates, using both wit and intelligence to outclass them most of the time. However, in doing this, he’s still saying some wrong things and annoying plenty of people at home. He’s made probably the biggest impact this week and has been a central character to the entire series. A comment about Sally’s bunions (I didn’t even know what bunions were, now I wish that I still didn’t) didn’t go down well in the house and caused a big argument with Ryan in particular. 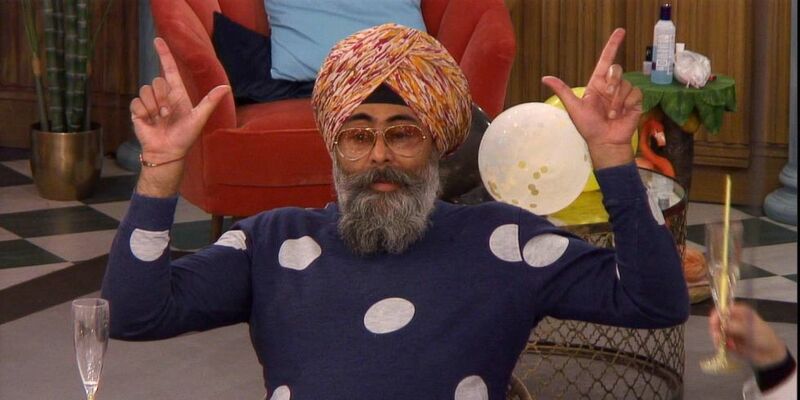 The general consensus seems to be that the housemates are ganging up on Hardeep somewhat. When it was announced that it would be Hardeep vs. Sally facing eviction, my first instinct was that Hardeep would probably survive for the fifth time. However, I did wait until Thursday night before backing her to go, as he received at least two harsh edits earlier in the week. I thought he had a great show on Thursday. During the etiquette debate, some of the other housemates like Nick and Sally were quick to try and shut him down, without debating him or listening to what he had to say. They also had a big problem with male friends kissing each other on the lips platonically, which Hardeep said was something he did himself. Later on, Sally asked Hardeep if he only mixed with “Punjabi families”, which could well be the final nail in her coffin. The fact that Hardeep has survived four times, has contributed so much to this series, is a man and is Scottish, has to make Sally the valid favourite to go in this eviction. The edit last night convinced me to back Sally fairly heavily, as it did seem designed to save Hardeep. A final without him would be a bit odd, and producers will want him there as plenty of viewers will wonder whether or not he can actually win. Because Sally is more well-known and has been a famous Celebrity Psychic for decades (she’s done everyone, apparently), I do recognise that this eviction could be closer than most this series. I won’t be sharing thoughts about the outright market until the day of the final, which is Monday. My opinions and market positions are constantly evolving and updating, the vote isn’t open yet, and so whatever I posted now could be redundant by Monday afternoon. What I will say, is that I’m half-expecting a backdoor eviction on Sunday. Emma Willis stated on Tuesday that tonight is the “penultimate eviction”. Either she misspoke, and she meant that it was the penultimate live show, which is quite possible, or someone (*cough* Gabby) is getting the backdoor boot on Sunday. I’m looking forward to finding out. Do you think Sally will be a not-so-happy Medium tonight, or is there value in backing Hardeep to go? Feel free to let me know your thoughts below.